What is the Air Purifier ACH Rating? ACH stands for “Air Changes per Hour” and is one of the least understood ratings on air purifiers. The ACH rating indicates how many times per hour and air purifying device can exchange the air within a room. 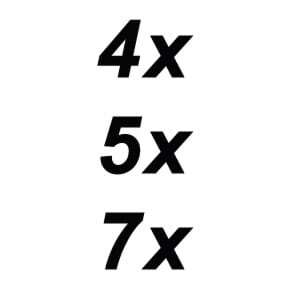 For example, an ACH rating of 5x means that the full air volume is exchanged five times every hour. When you’re comparing two different air cleaners, this rating is important because it can quickly show you which product is the clear winner in regards to fresh air exchange. A 3x rating is worse than a 4x rating, while a 6x rating is better than a 5x rating. The more times a device can exchange the air within the room, the cleaner and fresher it will stay. We recommend that you never buy a product that has less than a 4x ACH rating. Doing so means you’ll be getting an inferior unit. Take a look at our top recommendations the best air purifiers with high ACH ratings here. Now, for those of you who want to have a little fun with this number using some simple math, you can actually stretch or reduce the power of an air purifier’s ACH rating using a simple calculation. All air purifiers display a Cubic Feet per Minute (CFM) number under the specifications. Find this number on an air purifier that you’re considering. We’ll use 300 CFM as an example. If you multiple the CFM by 60 (minutes per hour) and divide by 8 feet (average ceiling height). Then divide that total by the ACH rating, you’ll end up with the maximum square footage number for the air purifier. Now, let’s say you wanted to increase the air changes per hour inside a room. All you have to do is replace the ACH number above with the target ACH rating you’re trying to achieve. This will then tell you what the maximum space the product can then cover. For example, if we replace 4 ACH in the above equation with 7 ACH, the end result would be 321 sq. ft. of coverage. This means that you can almost double the air changes per hour using the same device, as long as your place it inside a room that doesn’t exceed 321 sq. ft.
What is the Air Purifier CADR Rating? 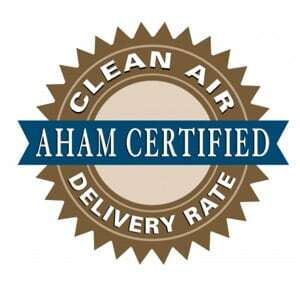 CADR stands for “Clean Air Delivery Rate” and it’s a rating that was created by the Association of Home Appliance Manufactures (AHAM). The CADR rating is a certified measurement that shows consumers how well an air purifier can clean the air within a specific room size. It’s purpose is to give you an objective standard to evaluate the effectiveness of an air cleaning device. This rating is the best way to know what the true cleaning capacity is for an air purifier. As you would expect, the higher the air purifier CADR rating, the more effective the product is at cleaning the air. Rating numbers equate to speed. Higher ratings mean that air purification device is faster at cleaning the air, while lower ratings indicate a slower cleaning rate. In order to help consumers properly compare and contrast home appliances, the AHAM stamps a seal on products that meet or exceed their specific set of criteria. The air purifier CADR rating is displayed as a set of three numbers. For example, 150/200/180. The AHAM rating certification is important because manufacturers can list any maximum room size they choose on a product. This type of marketing may entice you to buy the device, but it’s worth a closer look to find out if it’s really a good deal or not. For example, with all other features being equal, let’s say that product A states that it can purify a room up to 400 sq. ft., but doesn’t include the AHAM seal. Product B claims it can purify a room up to 250 sq. ft. and includes the AHAM seal with the CADR rating of 170/150/190. Which product is a better investment? At first, you may think product A is a better deal because it can purify a larger space, however there is no proof that this is true. Product B, on the other hand, backs its claim with statistical data using the CADR rating. With all else being equal, product B would be the better buy because you can rest assured that it was actually tested and verified that it works up to the room size it claims. An interesting bit of knowledge in regards to the maximum room size number is that it’s roughly 1.5x that of the CADR rating for tobacco smoke. Using our previous example of 170/150/190, where 170 represents tobacco smoke, 170 x 1.5 = 255 sq. ft. This number equals roughly the same square footage that product B claims to be able to handle. Now you know what ACH and CADR ratings on air purifiers mean, why they’re important, and how to read them.